This article is about the status effect which means "power-up". For the power-ups that transform Mario into different forms in various Mario platformer games, see List of power-ups. POW-Up is a positive status condition that has appeared in several Mario RPGs. It stands for "Power-Up". Red Peppers boost attack power (and give the Heavy G status effect) in Mario & Luigi: Superstar Saga, giving more power to Mario and Luigi's attacks. 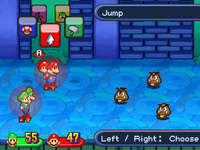 The status is indicated by a red burst with an arrow pointing up next to Mario and Luigi's HP. Red Peppers appear again in Mario & Luigi: Partners in Time, although they affect both fighters currently active and do not give the Heavy G status. POW-Up is indicated by an expanding red circle around the character. Certain enemies can also raise their own attack power by becoming enraged (usually due to low HP), like Bullies. 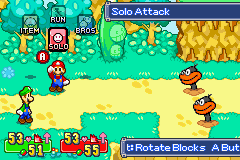 The POW-Up status effect also appears in Mario & Luigi: Bowser's Inside Story, with the same effects as the previous games. It can be received by Bowser if he inhales the meat seen during the second Midbus battle. POW-Up returns in Mario & Luigi: Paper Jam. By using a POW-Up Battle Card, Mario, Luigi and Paper Mario can increase their attack power. In Paper Mario, Watt's ability, Turbo Charge, can increase Mario's attack power by 1 for one to four turns. Also, some enemies can charge their power like the Hyper Goombas and Hyper Clefts. In Paper Mario: The Thousand-Year Door, several items and the Crystal Star power called Power Lift can raise attack power. The "Attack is boosted!" status is indicated by an angry face above Mario or his partner. Charging also boosts attack power for the next attack only; this is indicated by the affected character changing color repeatedly in a pulsing fashion. Enemies can have this status effect, also, by taking up a turn to charge. In Paper Mario: Sticker Star, it acts like Paper Mario: The Thousand-Year Door. Mario can obtain it with a Leaf sticker, and Sombrero Guys can give it to other enemies. The player can also use the Boom Box to double their attack. This page was last edited on December 17, 2018, at 15:09.